alaTest has collected and analyzed 12 reviews of BUNN NHBB Velocity Brew 10-Cup Home Brewer, Black. The average rating for this product is 5.0/5, compared to an average rating of 4.4/5 for other products in the same category for all reviews. Views about the reliability and size are overall positive. The usability and price also get good feedback. Many are critical about the durability. We analyzed user and expert ratings, product age and more factors. 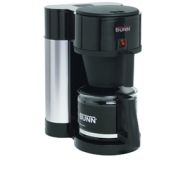 Compared to other products in the same category the BUNN NHBB Velocity Brew 10-Cup Home Brewer, Black is awarded an overall alaScore™ of 81/100 = Very good quality. When you find 10 cups of water on your counter. Trash it. Super-fast, hot, "pure"-tasting coffee, from a name you can trust! Hot water. Fast brewing. No steam. Cost. Must make at least 4 cups. A thermal carafe option would be a good touch on this model.